We have been lied to for decades! We are committed to a healthy lifestyle and the marketers have convinced us that eating unfermented processed soy is good for us such as soymilk, soy cheese, soy ice cream, soy burgers and even soy infant formula! This couldn’t be further from the truth! Soy unfermented can be damaging to your health for a plethora of reasons that I will explain here. Now fermented soy products have many health benefits which the Asian people have been consuming for centuries and in small amounts, organic and fermented. Products such as natto, tempeh, soy sauce and more. Why Do We Eat Soy? The soy industry invested massive amounts of money in advertizing back in the early 90’s to boost the sale of this so called “miracle health food” with amazing success. Soy Food sales increased from $300 million to almost $4 billion in a few short years. This proves that Americans want to eat healthy and we have fallen into this trap of what I call brainwashing from the marketers. Now perceive soy as a health food and consume it almost daily. The FDA even claims that consuming 25 grams of soy protein daily reduces your risk of heart disease! This is very soon to change! See tomorrow’s post. There is a large amount of scientific research showing that soy is not the nutritional panacea of the 21st Century. Your local food market is full of products laden with unfermented processed soy. Even worse is that genetically modified soy is in these products with are laden with pesticides and herbicides which destroy our gut bacteria and cause many other issues especially with our brains. In America the soybean produces two golden products – protein and oil. There is nothing safe or natural about them! Dr. Kaayla Daniel, author of The Whole Soy Story, points out thousands of studies linking soy to malnutrition, digestive distress, immune-system breakdown, thyroid dysfunction, cognitive decline, reproductive disorders and infertility—even cancer and heart disease. 1. GMO! 93 percent of soy grown in the US is genetically modified. The soy is doused with toxic chemicals (herbicides and presticides) to keep the weeds from growing and yield a larger crop. The downside is that we end up eating these chemicals which disrupt our health and wreak havoc on our hormones and much more. The plants also contain genes from bacteria that produce a protein that has never been part of the human food supply. Soy allergies have increased due to GMO processes. GM soy is linked to infertility in future generations. Americans are eating a large amount of soy which is the main issue because soy has anti-nutritional factors which rob us of vitamins and minerals. The only way they are neutralized is through the fermentation process. 3. Soy, The Clot Promoter. Soy contains Hemagglutinin which is a clot-promoting substance that causes your red blood cells to clump together. These clumped cells are unable to properly absorb and distribute oxygen to your tissues. 4. Soy, The Thyroid disruptor. Soy contains Goitrogens which are substances that block the synthesis of thyroid hormones and interfere with iodine metabolism, thereby interfering with your thyroid function. 5. Soy, The Estrogen Mimicker. Soy is loaded with the isoflavones, a type of phytoestrogen, which resembles human estrogen. These compounds mimic the hormone estrogen, and too much estrogen is not good for you. Soy phytoestrogens are known to disrupt endocrine function, may cause infertility, and may promote breast cancer in women. The FDA regulates estrogen-containing products, but no warnings exist on soy. They process soybeans in aluminum tanks using an acid wash. This leaches very high levels of aluminum and manganese into the food. Soy infant formula has 80 times more manganese than in human breast milk. 7. Soy, The Infant Health Risker. Would you give your baby birth control pills? Well feeding your baby soy formula is like giving them five birth control pills a day and it can harm your baby’s sexual development and reproductive health irreversibly. Is There Any Soy That Is Good For You? 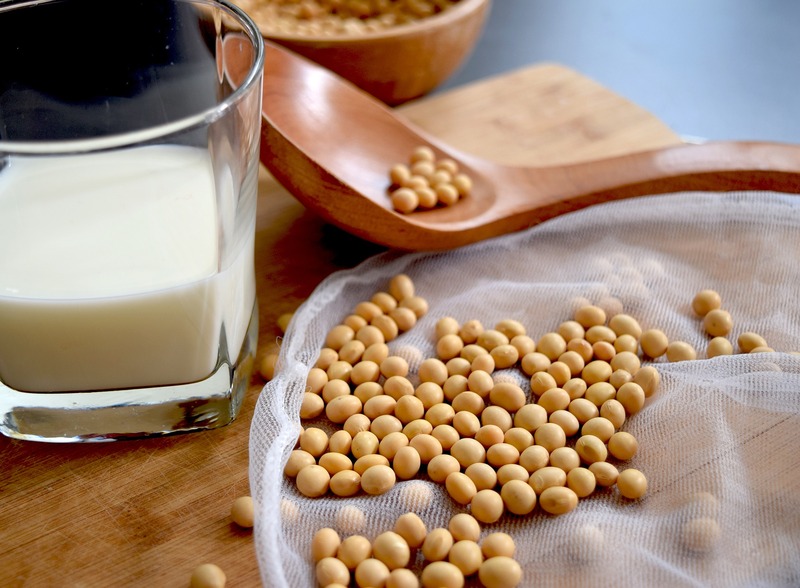 Soy can be very healthful ONLY if it is fermented, organic and consumed in small amounts. When soy is fermented, the phytate and “anti-nutrient” levels are reduced and the benefits are plentifully available to your digestive system. · Tempeh a fermented soybean cake with a firm texture and nutty, mushroom-like flavor. Cook it up like meat in a fry pan. · Miso, a fermented soybean paste with a salty, buttery texture which makes an amazing miso soup. · Natto, fermented soybeans with a sticky texture and strong, cheese-like flavor. · Tamari sauce, is made by fermenting soybeans, salt and enzymes. I prefer Tamari sauce over soy because it is wheat free. Make sure you purchase organic tamari sauce as you will be sure to not get GMO soy and chemicals. Please note that tofu is NOT on this list. Tofu is not fermented, so is not among the soy foods I recommend. Remember that unless soy is fermented (tempeh, miso, natto, or traditionally made soy/tamari sauce), you’re better off avoiding it. The easiest thing to do is eliminate all processed foods and eat the way that mother nature has taught us. If it doesn’t walk, fly, grow or swim, give it a second thought. Check labels to see if it contains soy which must be listed due to the fact it is an allergen. Tune in tomorrow for more information on how The FDA is now saying that soy is not good for your heart.